As part of our commitment to product development, SOS visited a local special school to see Rebound Therapy in action using the Nessie Positioning Aid. Rebound Therapy is used to facilitate movement, promote balance and promote and increase muscle tone, improve fitness and improve communication skills. 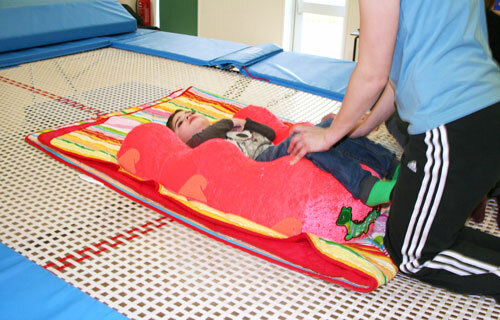 The client is positioned on a trampoline and bounces in a controlled way with support from a therapist. The session took place with three children of varying sitting ability. The bumps and contours of Nessie have been shaped to provide support during the primary positions associated with physical play therapy. Nessie was used throughout with a focus on long sitting during bounces, supine (lying on your back) and crawling on all 4s. The children seemed to really enjoy using Nessie with smiles all around as they bounced. Two Nessies were used to support the children, the new XL and a medium sized. Made from flexible, low-density foam, Nessie is light enough to be portable but heavy enough to offer positioning support during therapy including Rebound. Please contact us if you would like more information. ReboundTherapy.org is the official UK body and international consultancy for Rebound Therapy. Founded in 1972 the term ‘Rebound Therapy’ was developed to describe the use of trampolines to provide therapeutic exercise and recreation for people with a wide range of special needs. Participants range from mild to severe physical disabilities and from mild to profound and multiple learning disabilities. These include dual sensory impairment and autistic spectrum. Rebound Therapy using trampolines to provide therapeutic exercise and recreation for special needs Rebound Therapy is used to facilitate movement, promote balance, promote an increase or decrease in muscle tone, promote relaxation, promote sensory integration, improve fitness and exercise tolerance and to improve communication skills. Interested in using Nessie for Rebound Therapy?